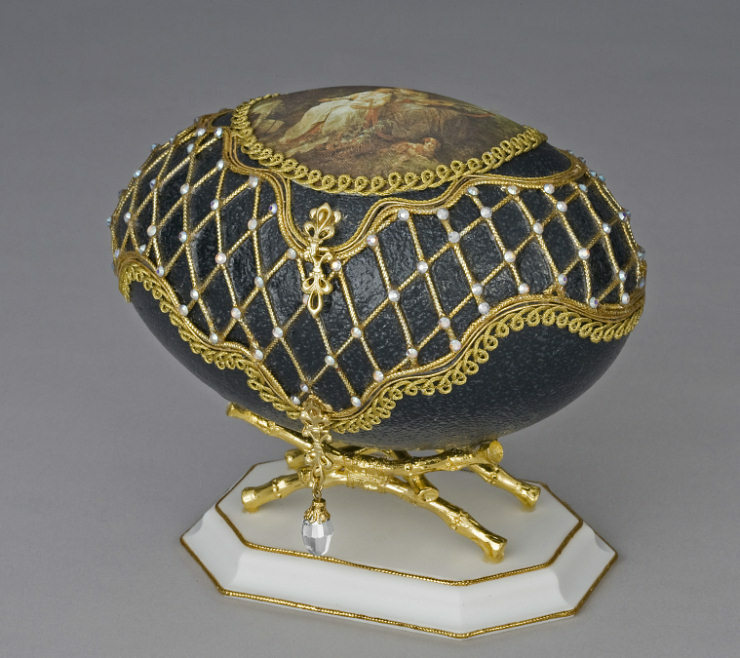 The Emu egg is converted into an elegant jewel box with two openings. The egg is decorated with golden cord and nag crystals on the outside. A beautiful silk print is placed on the top as embellishment. The well-decorate inside portion of the top compartment can serve as a stunning ring holder. The egg is lined inside with red velvet and is mounted on a golden stand. 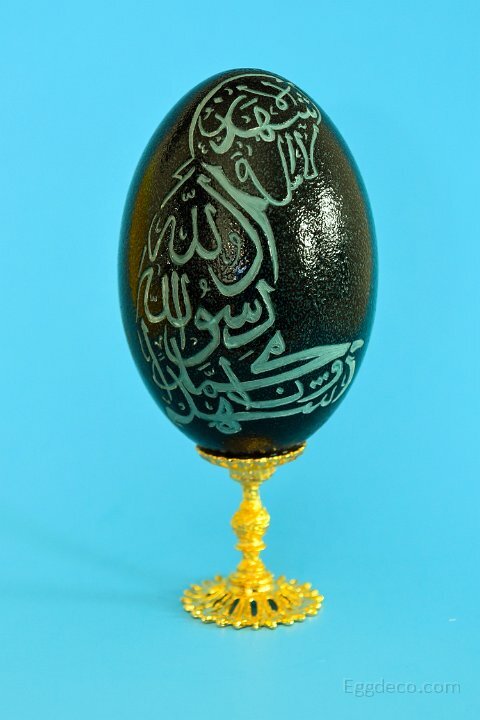 Emu Egg shell on which Islamic calligraphy is etched, declaring the Oneness of God. The etching reveals the inner light green color of this natural dark green Emu egg. 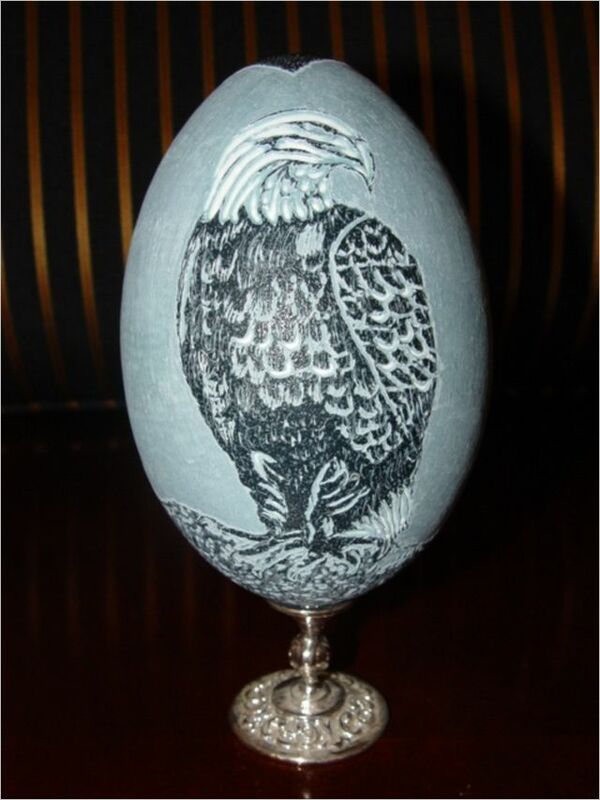 Emu egg is intricately carved to make a majestic bald eagle. The outermost dark green layer of the Emu egg is removed to make a smooth and even blue background. On the head portion of the eagle, the dark green layer is scarped out to reveal the delicate inner-most white layer. The egg is mounted on a silver stand. This elegant egg will add majestic beauty to any house! 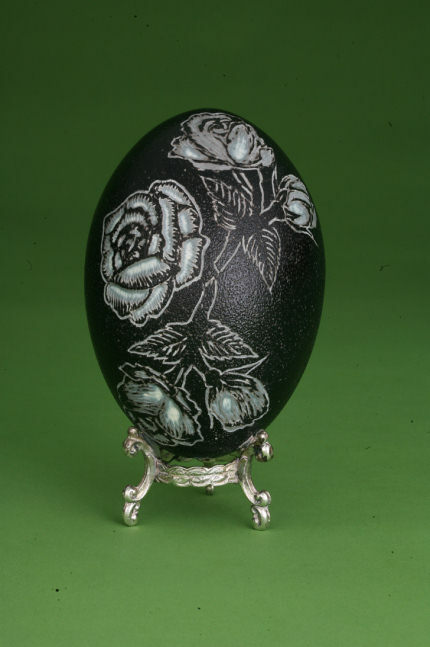 The Emu egg is painstakingly carved to make beautiful roses. The outermost dark green layer of the Emu egg is gently etched so that the underlying light bluish-green and whitish layers are visible in the rose petals and leaves. The egg is mounted on a silver stand. 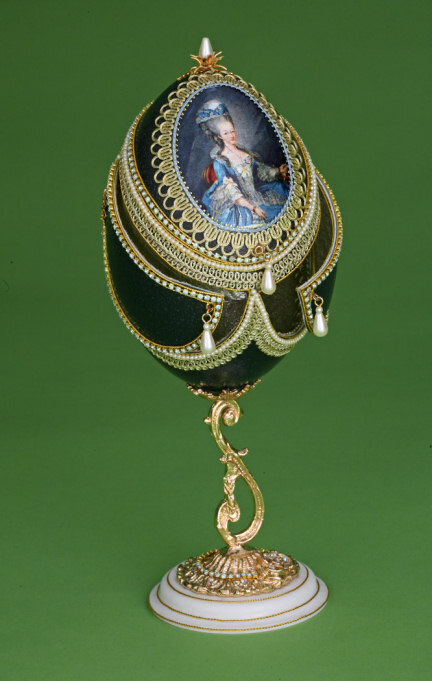 This elegant egg will add beauty to any royal household. The Emu Egg is cut to open three doors. The top door is decorated with a satin print. The inside of the egg is lined with brocade. The egg is mounted on a golden stand and placed on a white Corian base. 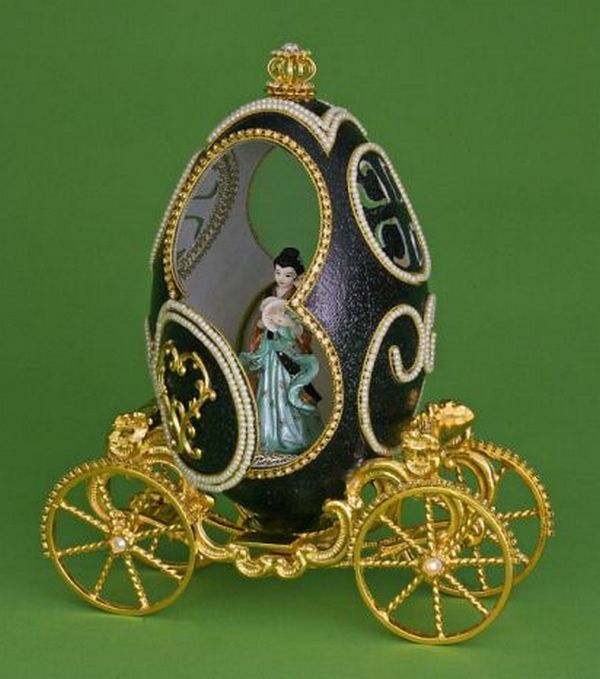 The Egg has a Victorian flavour and would be an excellent adornment for any mansion. This naturally dark-green Emu egg is dexterously cut to form a carriage with two open doors. The interior of the egg is lined with red velvet. Tufting of the seats, ceiling & foot rest add to the elegance of the carriage. The exterior is also decorated with red crystals placed very meticulously. A beautiful crown completes the decoration of the carriage. This Emu egg will surely be the cynosure of all eyes. 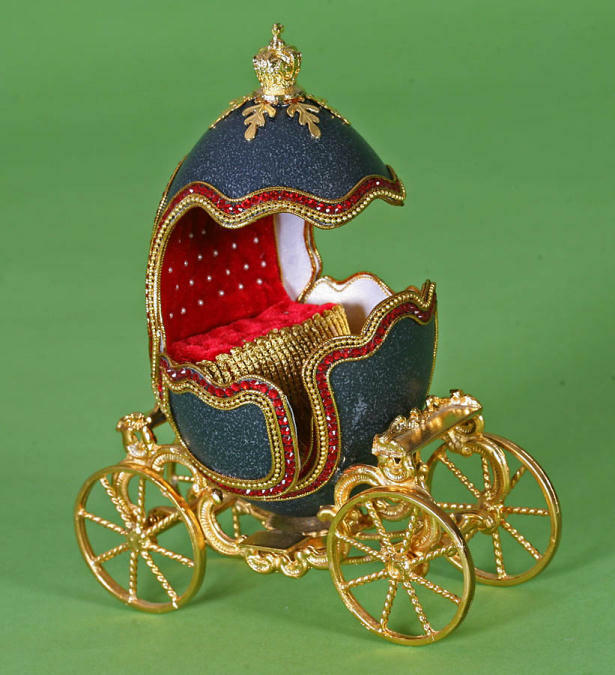 Emu Egg is cut to form a coach in which two door openings are cut and decorated with golden filigree. The coach is embellished with pearl string and rhinestone chain. The inside of the egg holds an elegant lady. Emu egg is cut into four portions. The middle portion is cut and reversed to fit on the top portion forming a canopy and the other portion forms the bottom half. Painted horses are placed alternatively up and down on the poles. 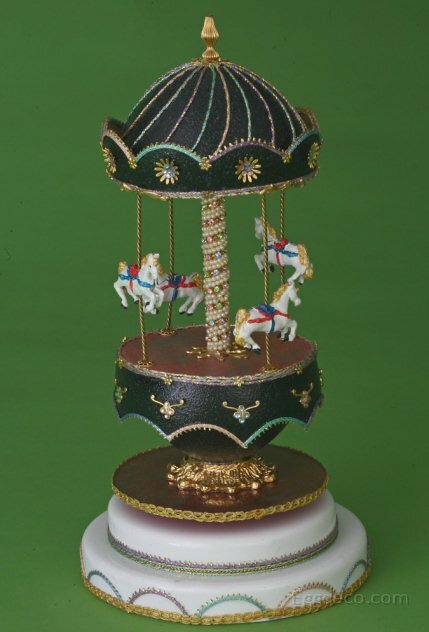 Golden filigree and colorful braids add to the embellishment of the carousel. This fascinating Emu egg carousel plays music while rotating. 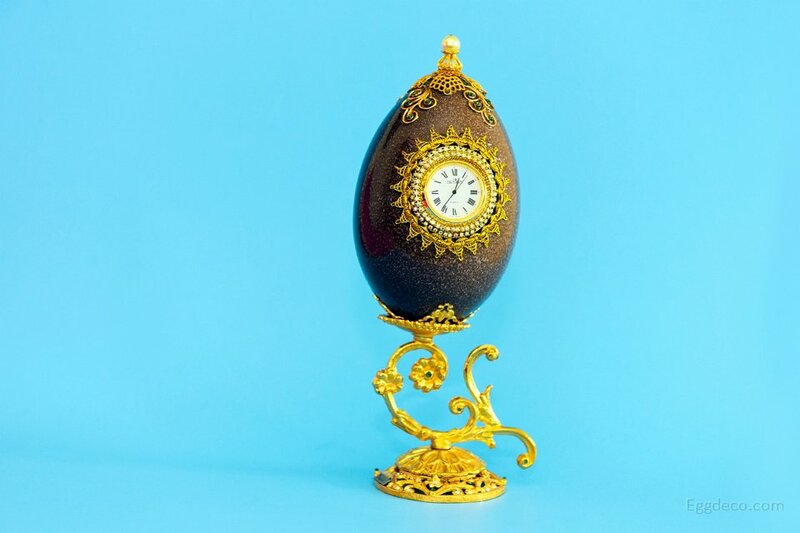 This is a real working Emu Egg Clock. The clock is decorated with rows of golden cord, rhinestone chains and golden filigree. The hemispherical doors at the back provide access to the clock mechanism. The egg is mounted on a golden stand. Emu egg with a beautifully carved top in the form of heart patterns. The egg is decorated with golden cord. The inside of the egg is lined with a mirror and decorated with flowers. 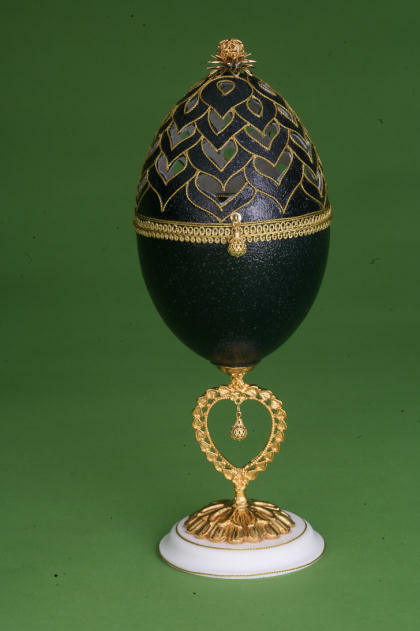 The egg is mounted on a heart-shaped golden stand. This elegant egg can enhance the beauty of any room. Emu egg is carved all around in beautiful floral patterns with free hand. This naturally deep green Emu egg is etched meticulously to maintain its original colour while the outlines of the floral patterns reveal the underlying teal green layer. 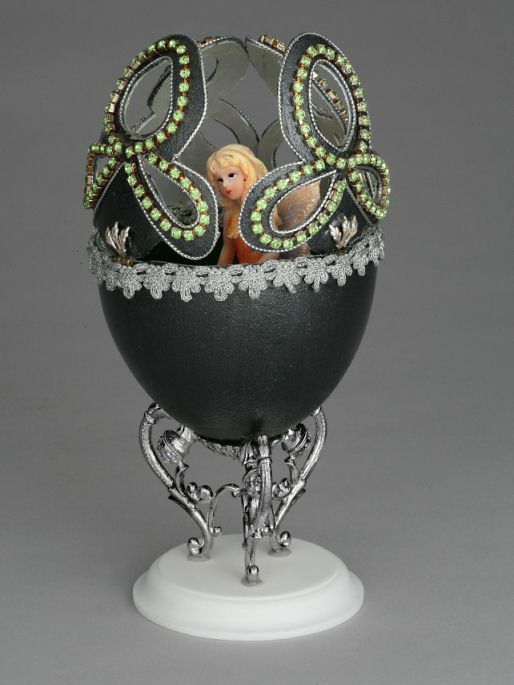 The egg is mounted on a golden Cupid stand. This attractive floral Emu egg denotes that freshness, beauty and love are in the air. The top half of this Emu egg is cut in the form of three tri-petals and is decorated with rhinestone chain and laces. Inside a beautiful fairy is placed. The egg is mounted on a golden stand and placed on a round white Corian base. This passionate egg will appeal to anyone with young hearts. This Emu egg has a complex design that combines floral latticework with shell-enlargement technique. The inside of the shell is decorated with golden polyflakes. Three heart cut-outs are made in the egg shell, which are lined with fine golden cord and a row of fine rhinestone chain. Two small golden bell filigrees are glued to each of the hearts. 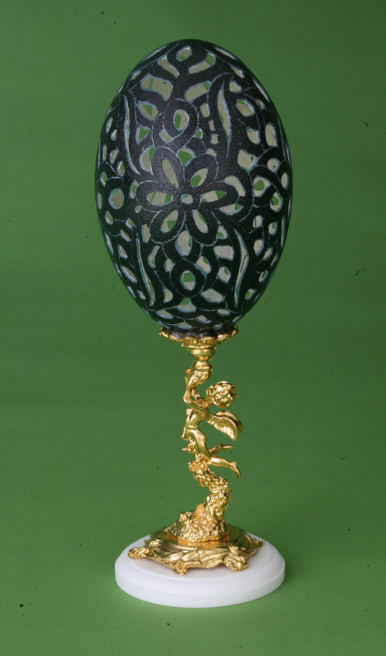 The top of the egg is decorated with a floral bead. 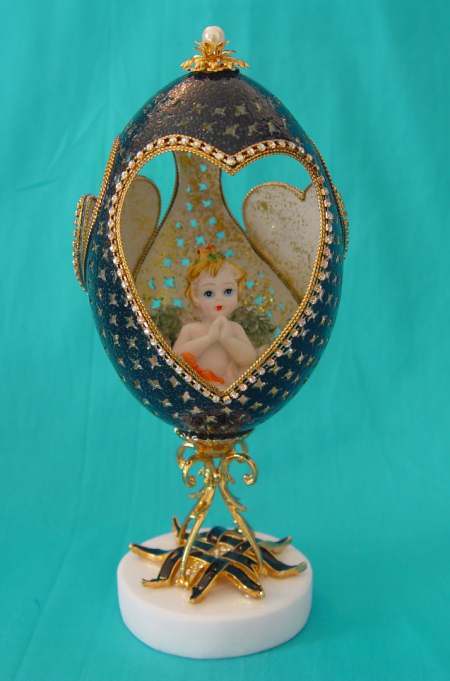 A 'Little Angel' is placed in the egg to give an aesthetic look. The egg is mounted on a golden enamelled stand and placed on a white Corian base. Emu Eggshell is cut in the shape of a swan. 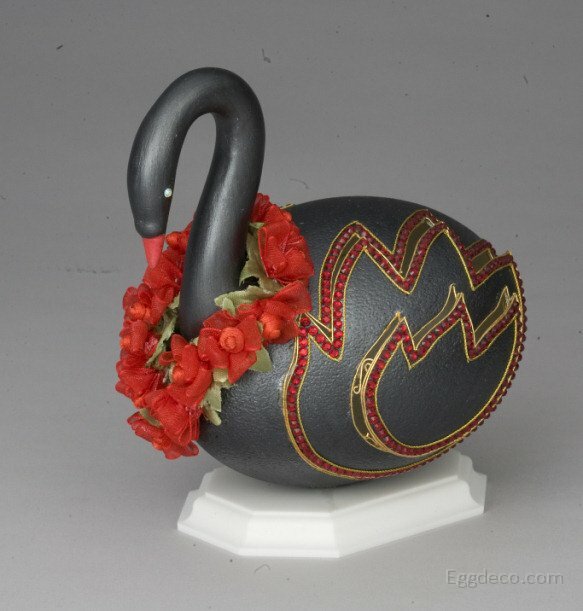 The neck of the swan, made of Plaster of Paris, is painted black and affixed on the body of the swan. The wings are attached using shell-enlargement technique. The wings are raised using small golden filigree and decorated with red crystals all around. A garland of red ribbon flowers is put around the swan’s neck. 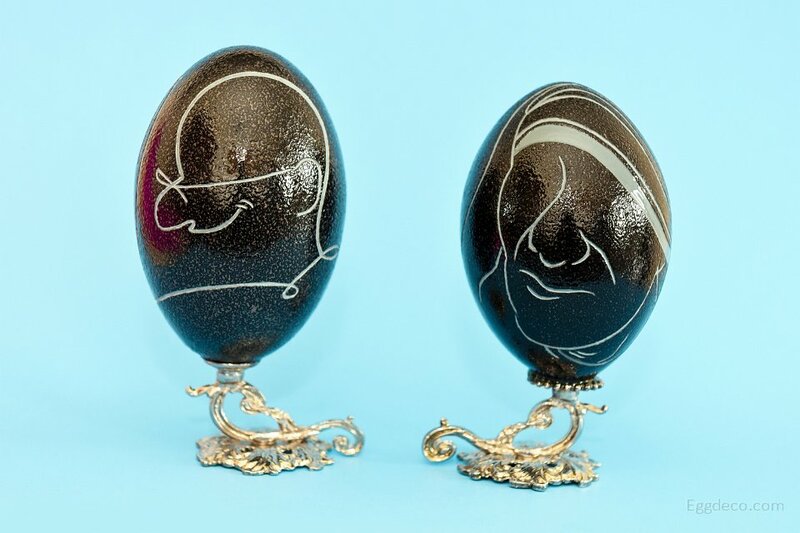 These Emu Egg shells are a tribute to Mahatma Gandhi and Mother Teresa, the two ‘Apostles of Peace’. They are depicted as engraved line art forms on naturally green Emu egg shells.